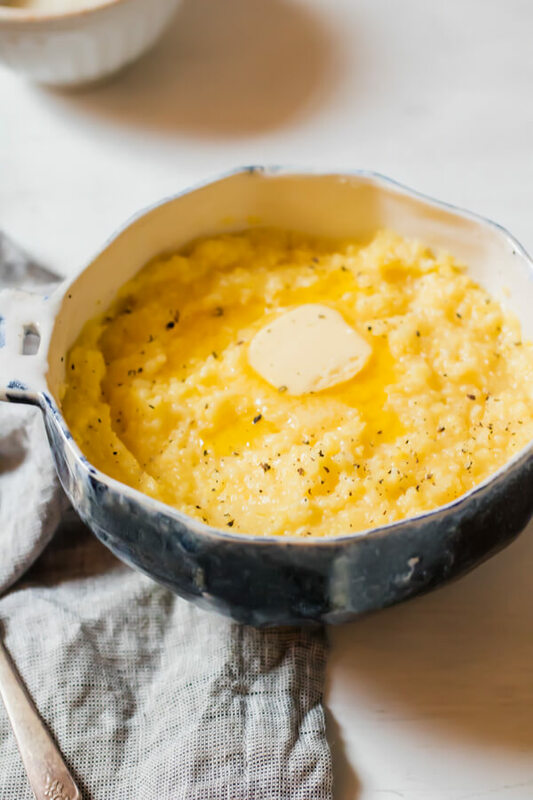 Basic easy creamy polenta made in the instant pot. No stirring required. 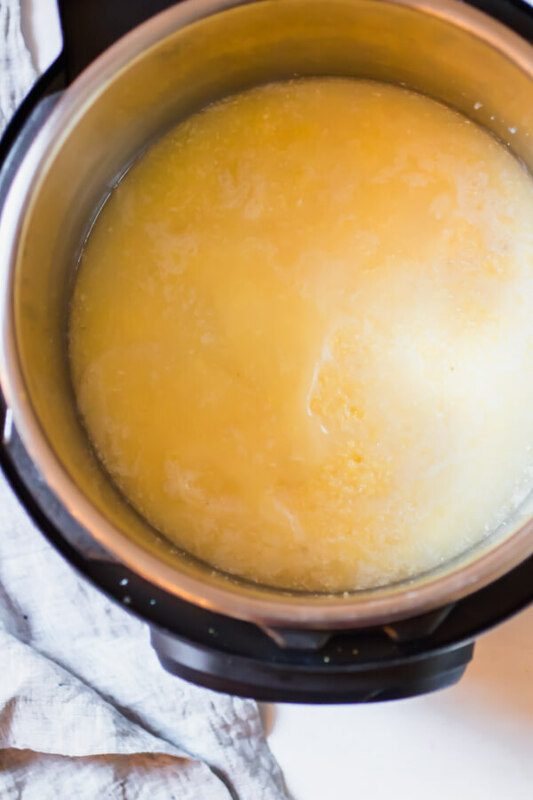 This is the easiest polenta recipe you will ever find and my favorite way to use an instant pot. 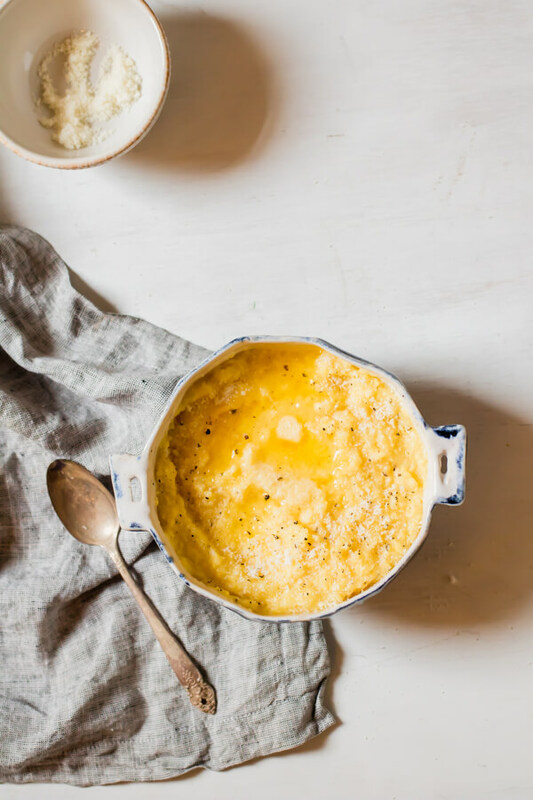 A warm creamy bowl of polenta is a dream come true. Simple food at it’s finest. 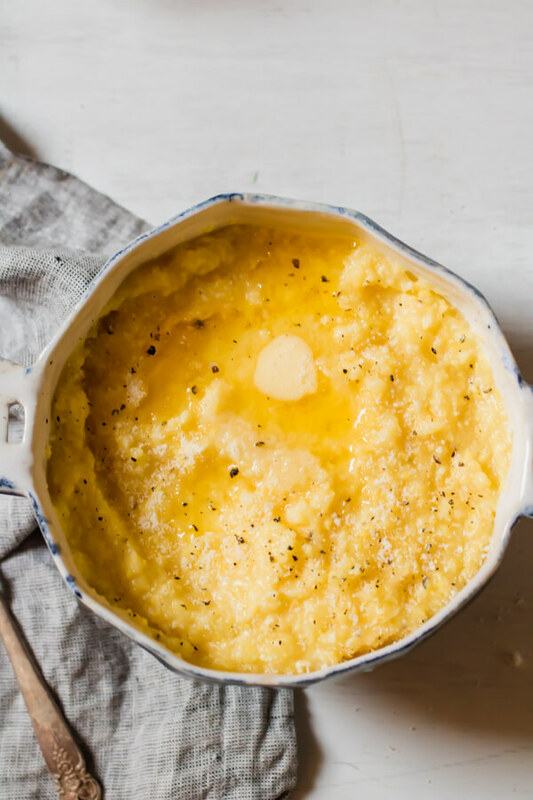 A starting point for something spectacular, or a comforting meal all on its own.Creamy polenta is one of my all-time favorite side dishes/ base foods. 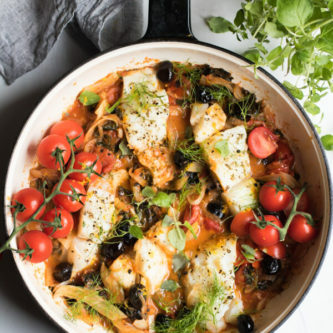 Top with perfectly sauteed mushrooms, or a turkey ragu, or quickly sauteed greens, or spicy roasted vegetables. The options are endless, the meal is utterly satisfying. The problem, however, resides in the temperamental nature of polenta. Must be stirred, frequently, using a wooden spoon, in a counter-clockwise motion (or was it clockwise?). I typically give up on polenta before I’ve even begun. Until I discovered that a pressure cooker + polenta = true love forever. Let me pause on the polenta for the quickest second to tell you I am still not a full instant pot convert. If you watch my insta-stories you would have seen yet another instant pot fail a few days ago. This may sound odd, me telling you that I am failing at the instant pot while simultaneously giving you an instant pot recipe. Here’s the thing. I am a truth teller. To a fault. I have always been (it’s a Scorpio thing). My friends and family know if they want to know the truth about anything, I am the person to talk to. I just don’t know how to be any other way. Therefore, when it comes to recipes and new kitchen gadgets I will always tell you my truthful, unbiased opinion. In regards to the instant pot, that truth is that I’m just not sure about it yet. It is brilliant for soups, homemade stock, and most vegetarian recipes. I have had great success with beans and grains, but protein is a whole different story. I am just not sure I believe all of you out there that are claiming delicious results when cooking protein. I’m hoping I just haven’t figured out the trick yet (but why does there have to be a trick??). Mark Bittman wrote in a New York Times article last month that he has become an instant pot convert, but mainly for grains and beans (we are in agreement) and he has also had recent great success with “small pigs’ tongue, “cooked in the instant pot for 30 minutes, I then cooled them, sliced them, and crisped them up in oil, with mustard and breadcrumbs — “deviled,” as they used to say.” Thank you, Mr. Bittman, but I won’t be cooking pigs’ tongue anytime soon. This brings us back to the polenta. The instant pot makes perfect porridge. Every. Single Time. Perfect, hands-off, porridge. Steel cut oats, quinoa porridge, teff porridge (recipe coming soon, my new morning obsession), and polenta. Yes, polenta is essentially porridge. Ground corn that turns into a creamy dreamy porridge-like dish. Score! It has been a polenta party in my house ever since this discovery. Polenta without the stirring, brilliant. It feels like it shouldn’t work, and when you first lift the lid (once pressure has been released) it will look like it hasn’t worked. But this is the time to get your stirring in. As soon as you lift the lid, take your wooden spoon (I like to use a flat-edged wooden spatula for this) and really work it out. Stir, stir, stir until you get that creamy texture you are after. So technically there is stirring, but not for a consecutive 40 minutes (as in original polenta). Once you have this perfect polenta what do you do with it? Swirl pesto throughout and top with roasted broccoli. 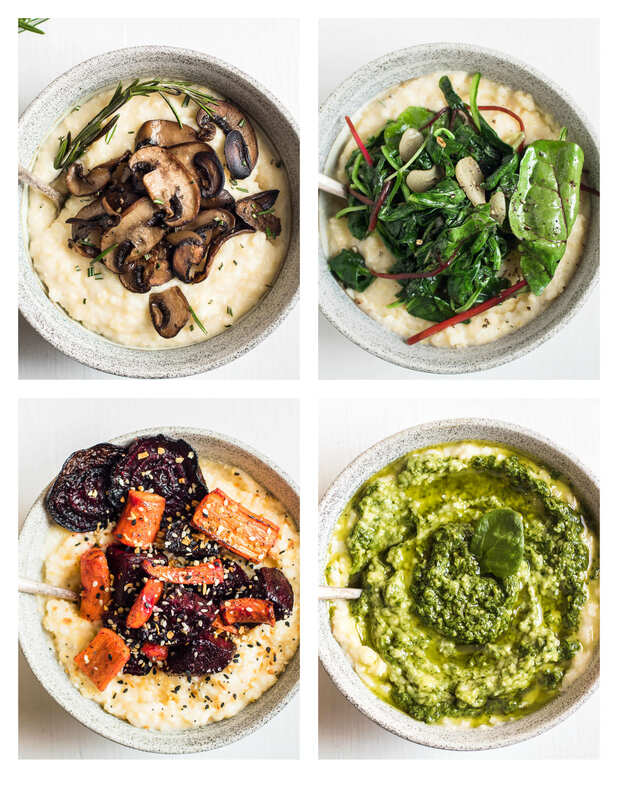 Here are 4 recipes for my favorite vegetarian polenta toppings! Naturally gluten-free (but please remember that corn is technically a starch, not a vegetable), and incredibly satisfying. Go ahead and add polenta to your meal plan next week, you won’t be sorry. I use Bob’s Red Mill organic polenta, you will want to find a medium-grind cornmeal not quick cooking or instant polenta. 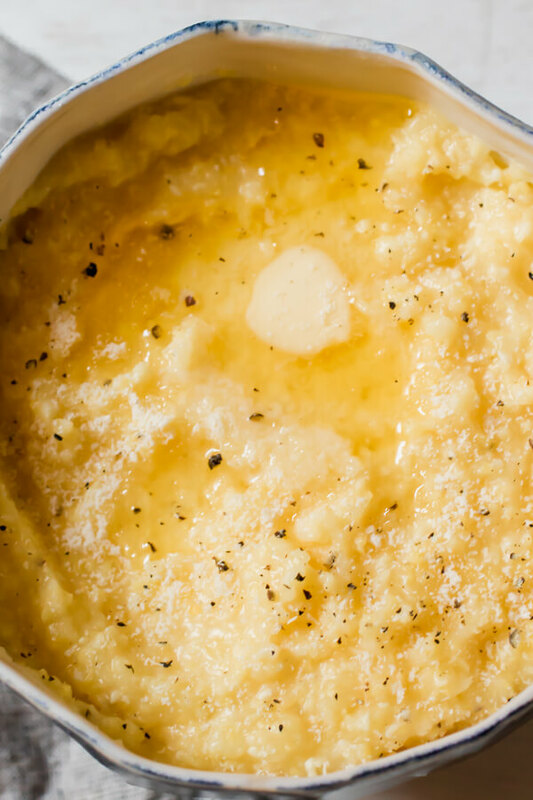 Easy polenta made in the instant pot pressure cooker. No stirring required. 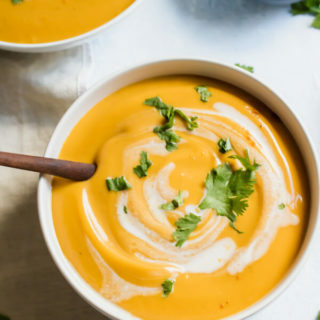 Add polenta, water, and salt to instant pot. Stir well. Lock the lid in place and turn the valve to the sealing position. Once pressure has naturally released open lid and stir well with a flat edge wooden spoon. Add your favorite mix-in's or toppings. Simple butter, salt, pepper, and parmesan cheese works quite well. For those of us who don’t own Instant Pots, here’s a ‘regular’ pressure-cooker option for making polenta. I haven’t tried it — it never occurred to me to make polenta in a pressure cooker! — but now I’m quite curious. I’ve tried this recipe twice and both times myb iP displays “burnt”, even tried setting the porridge setting to low. Using an IP ultra. Gosh that is so odd, I have honestly made this recipe over 10 times and I’ve never seen that display. 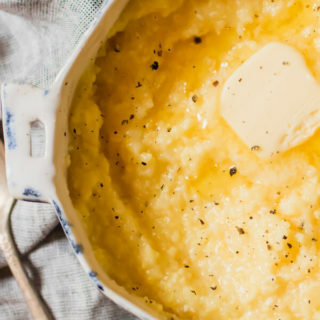 What kind of corn grits/polenta are you using? and are you using stock or water? I’ve also made several other porridge type recipes with the instant pot with great success including really small grains like teff. My instinct is that your IP is running too hot, but if you were able to adjust down to low that doesn’t make sense. I have had the same issue as well. Now ordinarily, when you make polenta, you add it to boiling water stirring for about a minute to break down some of the starches. Are you adding it cold water, and then starting the cycle? I used room temperature water, not ice cold and stirred it well before starting the cycle. You have to give it a good stir with a wooden spoon (I used a flat edge wooden spoon) when the cycle finishes, but other than that I’ve had success now close to 20 times. 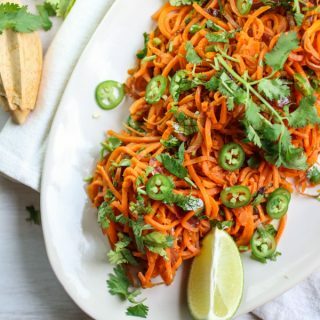 It’s one of my favorite go-to, quick and easy recipes. Thanks everyone, I’m using fine polenta and using room temperature water. I’m suspecting that the fine grain may be my issue. The porridge setting is 6 min by default, right at the 4 min mark it displays burnt. When I open it the polenta is done, a bit clumpy, but it smoothes out when stirred. We are having the same problem. We are using Bob’s Red Mill, medium cornmeal in an Instant Pot. The burnt indicator comes on before even getting to pressure. We have tried three times. Any suggestions would be great. I’ll let the others take over here because I’ve never had this happen to me and I’ve made the recipe dozens of times. What size instant pot do you have? I suspiciously believe this happens with an 8qt, I have a 6qt. I’ll do some digging and see what I can find out. I use the stackable steamer inserts for all my oats and quinoa recipes to avoid the “burnt” message. It works fine. 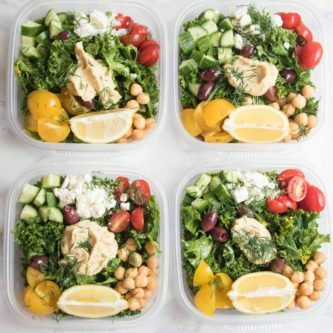 Just add your ingredients in the stackable and add a cup of water in the main instant pot insert and cook as directed. Amazing, thanks for the tip! So odd, some say this happens others say it’s perfect. I will go back and test this a few more times. I’ve never seen the burn display. I made grits this morning using the cooking method you use for polenta. They were perfect. Woohoo! Love hearing that. I don’t know why I’ve never thought of having polenta with chili, that is the perfect combo! Love polenta and the IP, thanks, I may make it tonight! Hope you don’t mind if I bust a huge misconception. For health reasons I no longer eat animal products, but I’m always being asked about where I get my “protein”. Truth is, all plant food has ample protein for humans and that’s where the animals we eat get it from… they are all vegetarian! Animals just STORE the proteins they accumulate from eating plants in their muscle, same as us. Contrary to the industry sponsored myths about meat being a superior source of protein, it is actually just stored, contaminated, adulterated, recycled, protein from plants! Far, far, healthier for all of us…and the animals and the planet, to just go to the source and eat the eat plants ourselves. Plants have a host of benefits like fiber, vitamins, minerals, antioxidants, phytochemicals, etc. that meat lacks. 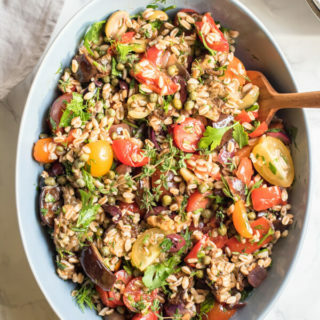 The healthiest and longest lived populations on Earth eat a traditional diet of around 75% satiating complex carbs like whole grains, legumes, tubers, seeds and nuts, with the rest consisting of fresh fruits and vegetables and only 1-5% of it comes from animal products, which are mostly added as flavoring. We now eat more meat than true carnivores do, and it’s killing us too, (as it almost did me) along with the fat, oil, sugar and salt that makes up the rest of the Standard American Diet. (S.A.D….so appropriate) I feel better at 67 than I did 30 years ago! 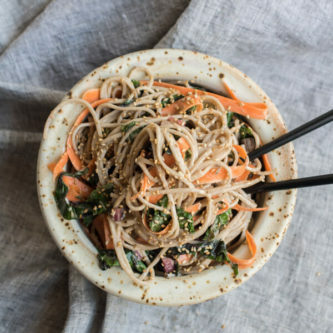 I’m still a foodie but found not relying on meat is liberating not limiting… I discovered so many delicious foods and cuisines I would have otherwise missed! What people do is on them, but everyone deserves to at lest know the truth! Thanks for the comment and I’m excited for you to try the recipe! My hope is that this platform can be a space to have a healthy discourse about food, so I am open to all thoughts and opinions. Your science, however, is flawed, and incorrect. I don’t advocate for any one diet, quite the opposite, I am a fierce advocate for individuality and finding a way of eating that works for you. Plants are awesome, I love them and wish to encourage more people to add more plants into their life – this is a worthy mission. Animal protein may or may not work for some people, but nutritionally speaking what you cited is incorrect. Plants are an incomplete protein source and because of this humans have consumed animals for thousands of years. Humans lack specific digestive and biological activity that animals have to make and absorb certain nutrients from the environment. B12 is the perfect example. If we were just like animals we would be able to either make B12 from our gut bacteria (like animals do) or we would eat feces to acquire adequate B12. We don’t do either, thus we must eat animals that are high in B12 to adequately supply our body with this vital nutrient. Vegans are notoriously low in B12 (note: it takes over 3 years for a B12 deficiency to show up), and must supplement with it. 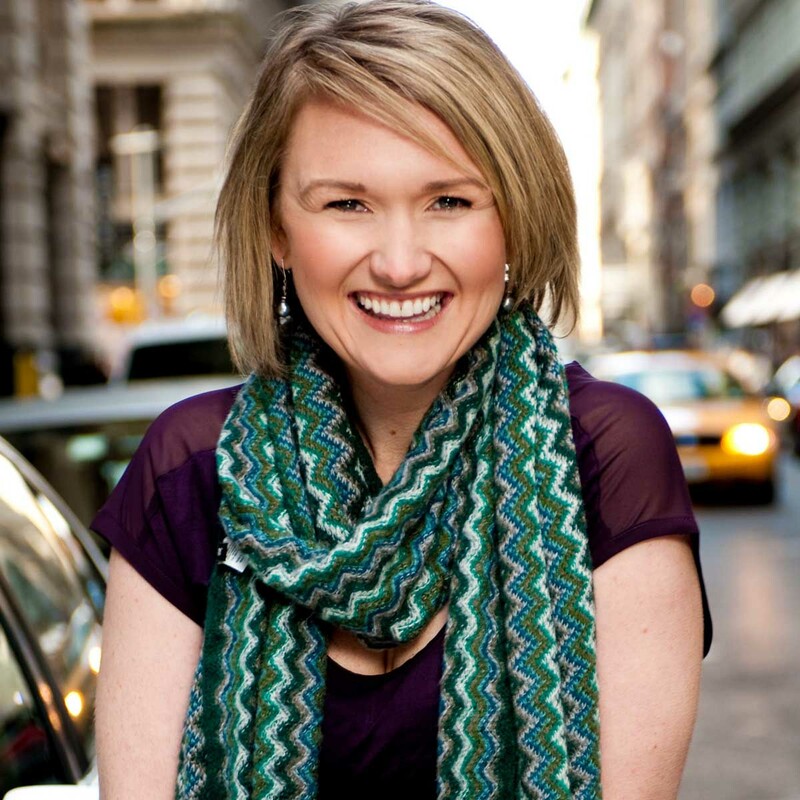 I have spent the last 2 1/2 years rigorously studying nutrition in a masters degree program, this is in addition to being a nutrition practitioner for 12 years and working with thousands of clients around the globe. 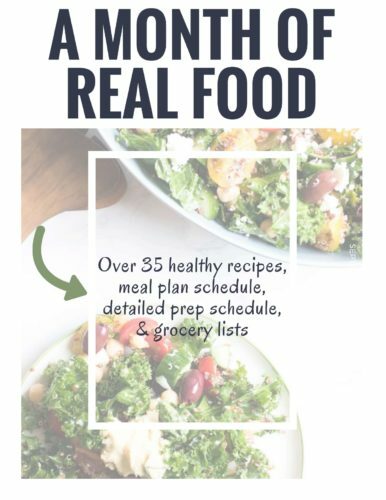 I believe in the power of whole real food. 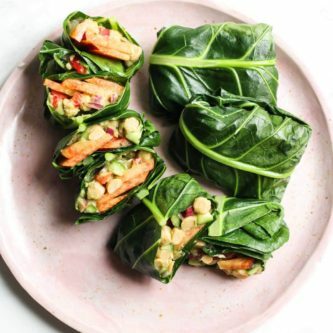 It is our most powerful medicine, there is no doubt about that, but I can tell you for certain I have worked with some individuals that were very ill on a vegan diet and required animal protein to get better. 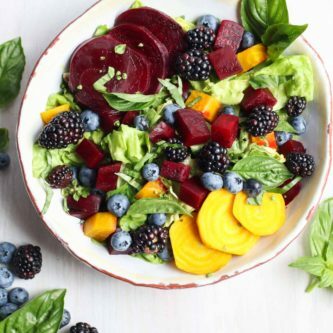 They required the right balance of amino acids, minerals, nutrients, enzymes, and co-factors that could not be found in the right synergistic combination in the plant world. I am so glad you have found a way of eating that works for you, that is phenomenal! I wholeheartedly agree that the SAD is quite awful and we as a culture are consuming way too much meat and processed food-like substances. If you study the “blue-zone” cultures of the world, the people who have lived the longest and healthiest are not all plant eaters, there is actually quite a bit of variance in diet from zone to zone. There is one commonality – they all eat some kind of animal protein. Checking for cooking times for Polenta so far I’ve found 5 minutes, 7 minutes and here 20 minutes. All for regular cornmeal. Seems that people can’t agree on pressure cooking times. Anything you look for has the same result. So I can’t say for certain if the instant pot would be the same as a traditional pressure cooker for timing. I used the porridge button which does cook the polenta for 20 minutes on high pressure. I tried 12 minutes and it wasn’t finished yet, I also tested at 17 minutes and it still wasn’t perfect. So in my testing 20 minutes seemed to be the right amount. First instapot recipe that tasted good. Not sure it really saved time. Ok…so my polenta ended up sticking a little but it was still delicious! When I opened the lid, there was no excess water. I think my problem was that I used veggie powdered bouillon mixed with water and even in usual cooking if that doesn’t get stirred it will stick. Perhaps I should have added additional water. It was still good and my family loved it. Topped with sauteed onions, garlic, mushrooms and herbs. It was great. My husband and I made this delicious polenta recipe tonight. We loved it!! We are a little hard to please with Italian dishes because having lived in Italy for seven years we have had the best. We were thrilled to discover that polenta in the Instant Pot is very easy!! We own the larger IP which is more likely to give a burn notice but it did not happen. We followed the directions given and used room-temperature water. We served it with a homemade tomato sauce and Italian sausage. If you like polenta but do not enjoy the constant stirring, then this recipe is for you!! I’m trying this recipe in a couple of days! We love polenta with chicken cacciatore and sometimes just a bit of ragu. For many years, I’ve made a version where I bake it in the oven, taking it out for a stir every ten minutes for 40 minutes. Delicious but a hassle! So I’m excited to try this one in my new ceramic inner pot for my Instant Pot! Ceramic inner pot for the instant pot? What are those magical words???? 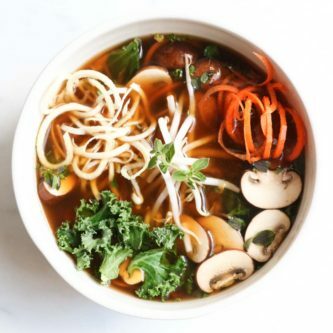 I need to stay on top of the instant pot goodness. You will have to give the polenta a really good stir when it finishes, but this recipe has changed my polenta life. Hope you love it! Thank you for this easy recipe and the discussion. For a potluck party, I doubled the recipe in my IP Ultra, first spraying the bottom of pot with coconut oil, added Bob’s Redmill polenta 2 cups, 8 cups filtered room temp water, 1 t. Himalayan salt, well-stirred. Like the other reviewer my pot displayed “Burn” at the end of Porridge cycle (20 min.) which is a bit alarming but the polenta came out great. I did add another teaspoon of truffle salt and parmesan cheese to get it to our liking but the consistency and ease were fantastic. So glad it turned out Lesli! I don’t know what the “burn” display is all about, it’s never happened to me but I have a 6qt? I wonder if it happens more with the 8qt? I make polenta all the time. I get my cornmeal from relatives in Italy, and it is quite coarse. I traditionally add cubes of cheddar, Swiss and grated parm, as my grandfather did. It is a traditional northern Italian dish. I serve it with braised chicken and gravy. It is also good with a traditional red meat gravy( sauce). Making it in the IP is a real time saver. Yum, all of those varieties sound amazing! Imagine my joy…after coming home from vacation to an empty kitchen and a hungry family who needed feeding STAT! This and some baked fish from the freezer and some limp veggies from the bin were a perfect half hour dinner. Thank you! They were PERFECT! I added a knob of butter and some Gruyere…delicious. Yay, I’m so glad it worked out! 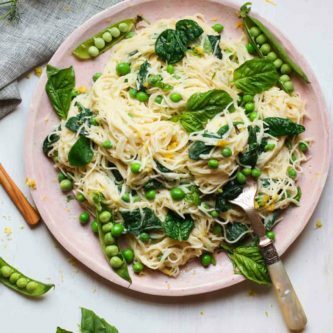 Three cheers for quick and easy dinners that the whole family loves! I portion 1 cup of dried polenta into 6 servings. I followed the measurements precisely but got a burn notice after just a few minutes of coming up to pressure. I was able to salvage it, but there’s something off about the recipe. As I’ve mentioned in other comments I have tested this recipe over a dozen times and I have never received a burn notice, not once. It is near impossible for me to troubleshoot this when it isn’t happening to me. I followed exactly and got a burn alert at 10 minutes. I quick released the steam and opened it and it was cooked already. I vigorously stirred, added a bunch of butter, and served with maple syrup and berries. Amazing.